The first consul of the French republic, in the name of the French people, and his majesty the king of the united kingdom of Great Britain and Ireland, being equally animated with a desire to put an end to the calamities of war, have laid the foundation of peace, by the preliminary articles, which were signed in London the 9th Vendemaire, (or the first of 0ctober 1801). 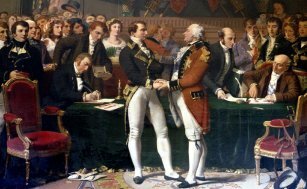 There shall be peace, friendship, and good understanding between the French republic, his majesty the king of Spain, his heirs and successors, and the Batavian republic, on the one part, and his majesty the king of the united kingdom of Great Britain and Ireland, his heirs and successors, on the other part. All the prisoners made on one side and the other, as well by land as by sea, and the hostages carried off, or delivered up during the war, and up to the present day, shall be restored without ransom in six weeks at the latest, to be reckoned from the day when the ratifications of the present treaty are exchanged, and on paying the debts which they shall have contracted during their captivity. Each of the contracting parties shall respectively discharge the advances which shall have been made by any of the contracting parties, for the support and maintenance of prisoners in the countries where they have been detained. There shall be appointed by mutual consent for this purpose a commission, especially empowered to ascertain and determine the compensation which may be due to any one of the contracting parties...The time and the place shall likewise be fixed, by mutual consent, for the meeting of the commissioners, who shall be entrusted with the execution of this article, and who shall take into account, not only the expenses incurred on account of the prisoners of the respective nations, but likewise on account of the foreign troops, who, before being taken, were in the pay, and at the disposal of one of the contracting parties. His Britannic majesty restores to the French republic and its allies, viz. his Catholic majesty and the Batavian republic, all the possessions and colonies which respectively belonged to them, and which have been either occupied or conquered by the British forces, during the course of the present war, with the exception of the island of Trinidad, and of the Dutch possessions on the island of Ceylon. His Catholic majesty cedes and guarantees, in full property and sovereignty, the island of Trinidad to his Britannic majesty. The Batavian republic cedes and guarantees, in full property and sovereignty, to his Britannic majesty, all the possessions and establishments in the island of Ceylon, which previous to the war belonged to the republic of the united provinces, or to the Dutch East India company. The port of the Cape of Good Hope remains to the Batavian republic in full sovereignty, in the same manner as it did previous to the war. The territories and possessions of his most Faithful majesty are maintained in their integrity, such as they were antecedent to the war. However the boundaries of French and Portuguese Guiana are fixed by the river Arrowary, which empties itself into the ocean above Cape North, near the islands Nuovo and Penetentia, about a degree and a third of north latitude. These boundaries shall run along the river Arrowary, from its mouth, the most distant from Cape North, to its source, and afterwards on a right line, drawn from that source, to the Rio Brunco, towards the west. The territories, possessions, and rights of the sublime Porte, are maintained in their integrity, as they were before the war. The republic of the Seven Islands is recognised. The French troops shall evacuate the kingdom of Naples and the Roman states; the English forces shall also evacuate Porto Ferrajo, and generally all the ports and islands, that they occupy in the Mediterranean or the Adriatic. The evacuations, cessions, and restitutions, stipulated by the present treaty, shall be executed in Europe within a month; on the continent and seas of America and Africa in three months; on the continent and seas of Asia in six months, which shall follow the ratification of the present definitive treaty, except in case of a special reservation. In all cases of restitution, agreed upon by the present treaty, the fortifications shall be restored in the condition they were in at the time of signing the preliminiaries; and all the works which shall have been constructed since their occupation shall remain untouched. All the sequestrations laid on either side on funds, revenues, and credits, of what nature soever they may be, belonging to any of the contracting powers, or to their citizens or subjects, shall be taken off immediately after the signature of this definitive treaty. The fisheries on the coasts of Newfoundland, and of the adjacent islands, and in the gulf of St. Laurence, are placed on the same footing as they were before the war. To prevent all grounds of complaint and disputes which might arise on account of captures which may have been made at sea subsequent to the signing of the preliminaries, is reciprocally agreed that the ships and property which may have been taken in the channel, and in the north seas, after a space of twelve days, reckoning from the exchange of the ratifications of the preliminary articles, shall be restored on the one side and the other; that the term shall be one month for the space, from the channel and the north seas, as far as the Canary islands inclusively, as well in the ocean as in the Mediterranean; two months from the Canary island to the equator; and, finally five months in all other parts of the world, without any further exceptions or distinction of time or place. The ambassadors, ministers, and other agents of the contracting powers, shall enjoy respectively in the states of the said powers the same rank, privileges, prerogative, and immunities, which were enjoyed before the war by agents of the same class. The branch of the house of Nassau, which was established in the ci-devant republic of the united provinces, now the Batavian republic, having experienced some losses, as well with respect to private property as by the change of constitution adopted in those countries, an equivalent compensation shall be procured for the losses which it shall be proved to have sustained. The present definitive treaty of Peace is declared common to the sublime Ottoman Porte, the ally, of his Britannic majesty; and the sublime Porte shall be invited to transmit its act of accession as soon as possible. It is agreed that the contracting parties, upon requisitions made by them respectively, or by their ministers, or officers duly authorized for that purpose, shall be bound to deliver up to justice persons accused of' murder, forgery, or fraudulent bankruptcy, committed within the jurisdiction of the requiring party, provided that this shall only be done in cases in which tile evidence of the crime shall be such, that the laws of the place in which the accused persons shall be discovered, would have authorized the detaining and bringing him to trial, had the offence been committed there. The expenses of the arrest and prosecution shall be defrayed by the party making the requisition; but this article has no sort of reference to crimes of murder, forgery, or fraudulent bankruptcy, committed before the conclusion of this definitive treaty. The contracting parties promise to observe sincerely and faithfully all the articles contained in the present treaty, and will not suffer any sort of counteraction, direct or indirect, to be made to it by their citizens, or respective subjects; and the contracting parties guaranty, generally and reciprocally, all the stipulations of the present treaty. The present treaty shall be ratified by the contracting parties, as soon as possible, and the ratifications shall be exchanged in due form in Paris.